Augustus Loop v2.4.4 (Mac OS X versions) is released. This version fixes some distortion issues that could occur when changing the tape speed away from zero. Download all the above from the downloads page. All Mac OS X versions of Expert Sleepers plug-ins have today been updated. This is primarily a maintenance update to allow an update to the Licence Manager, but there are new additions too. The Licence Manager is updated to v1.1.0, with changes for compatibility with recent OS X releases. With this Licence Manager, please use the versions of the plug-ins listed below (or later). If you update any of your plug-ins to these new versions, please be sure to update all of them, and the Licence Manager. If you subsequently have activation issues, please work through the suggestions on the Licence Manager page before contacting us. • Added support for MIDI output of Song Position Pointer. • Added support for MIDI output of sysex data to the AAX version. • Fixed a possible crash when using the OSC browse dialog in 64 bit hosts. • Added ‘Match Note Offs’ feature to Silent Way ES-4 Controller and Silent Way ES-5 Controller. Minky Starshine is updated to v1.1.0 and Warbler is updated to v1.2.0. These are the first 64 bit releases of these two plug-ins (happily bringing the full Expert Sleepers line to 64 bit; adding AAX compatibility for everything is next on the list). 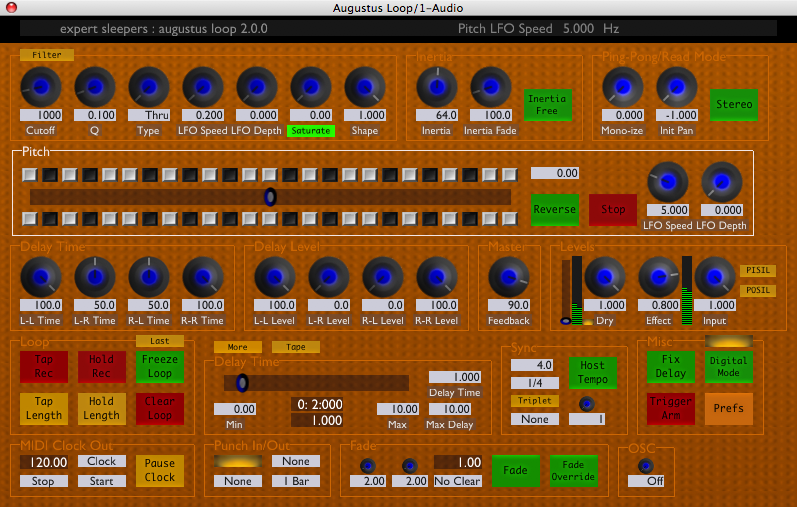 Augustus Loop v2.4.0 (Windows VST, 32 & 64 bit) is released. This is a maintenance release that rolls up a lot of minor enhancements and stability improvements to the code shared with Silent Way v2. Not an explicit mention, but you can see the Augustus Loop plug-in GUI on Brian’s screen right at the start of the video. Augustus Loop v2.3.1 is released. Only the Windows VST version is updated. * Fixed an issue with the Prefs button. * Fixed an issue where knobs would not work correctly if the mouse was dragged off the top of the plug-in window. We’re proud to announce the release of Augustus Loop v2.3.0. The headline here is that this is our first 64 bit Mac OS X VST, and so is usable without a ‘bridge’ in apps such as the 64 bit version of Reaper, and will be usable in any forthcoming 64 bit Mac release of Cubase. * First 64 bit Mac OS X VST release. * Improved handling of mouse events (dragging knobs would temporarily freeze the host UI on some platforms). * Improved accuracy of MIDI event handling. Announcing the Expert Sleepers Summer Sale 2010! From now until the end of August, we’re offering upgrades at half price. So now’s a great time to get your plug-ins updated to the latest and greatest. When upgrading, be sure to grab the latest Licence Manager from the downloads page. Augustus Loop v2.2.2 is released. - Fixed GUI issue in Reaper on Windows. - Added new OSC command (registerOSCPathForFunction). - Fixed a keypress issue in certain VST hosts (plug-in would respond to numeric input but not to pressing Return). Augustus Loop v2.2.1 is released. This is a bugfix release addressing some issues with the previous version (v2.2.0). As before, this is a 32/64 bit Intel only release for OS X 10.5 and above, so you only need this update if you specifically need the 64 bit functionality. - Fixed compatibility with OS X 10.5. - Worked around a bug in Digital Performer 7.1 which would cause a crash when the plug-in prefs dialog was used. - Generally improved stability of the Cocoa UI. We’re proud to announce the release of Augustus Loop v2.2.0. This is a milestone for Expert Sleepers as it’s our first 64 bit release. Specifically it’s a 32/64 bit Intel Audio Unit, and so can be used in native 64 bit mode in Logic 9 and Mainstage 2.1 when those hosts are running as 64 bit applications. From now on we anticipate that all our Mac releases will be Intel only, will support 64 bit use, and will require Mac OS X 10.5 or 10.6. There are no new features in Augustus Loop v2.2.0 other than the availability of a 64 bit variant. If you’re not using 64 bit hosts, there’s no reason to take this update. If you are though, download the update now from the downloads page. Update: there appears to be a problem with this version’s GUI and Digital Performer. Please use v2.1.2 with Digital Performer (which is 32 bit, so there’s no reason to use this 64 bit build anyway). Update: MOTU have confirmed this problem in DP 7.1. Update: there is also a problem with this version and OS X 10.5. A fix is being worked on. In addition to the previously mentioned bundles, the ‘Analogue Bundle’ is now available from the store. The Analogue Bundle combines the analogue synth controller Silent Way with two analogue-sounding delays, Augustus Loop and Little Spacey. A summary of all the currently available bundles and pricing is here. Augustus Loop is updated to v2.1.1. This version adds the new OSC functionality as recently added to Warbler and Silent Way for TouchOSC compatibility. Stephen Band has posted an Augustus Loop script in the spirit of the original multilooper example script and Axel's recent post. Read about and download it here. Ever since I figured out how to remote control clip recording in Ableton Live 7 over midi, which was about a year ago, I’ve been trying to build the “ultimate computer based loop station”. I’ve built increasingly more complex Live Sets utilized all sorts of routing tricks and midi conversion scripts and always ended up sort of discontent, because my setups could not be operated effectively with just the 10 switches and two pedals my Behringer FCB1010 midi controller provided. No matter what I tried, I always seemed to end up staring confusedly at the floor board wondering where the hell I was while my potentially brilliant musical idea vanished into thin air. Then I stumbled over Expert Sleepers Augustus Loop 2 which provided a completely programmable midi control environment and I knew this would give me all I needed to come up with a controlling setup I could use to actually control my loops. The main remaining problem now was that if I used more than one loop the FCB1010 out of the box wouldn’t give me any feedback on what loop I was operating on. Then I found out about the unofficial Uno firmware upgrade (http://www.ossandust.be/). I had a friend burn the downloaded image file on an eeprom chip and was now able to operate the unit in “stompbox mode”. In short, this makes it possible to have one row of buttons on the FCB1010 act as pedals that operate independently of the selected patches in the other row. Now, I can select a loop to control by stepping on one of the buttons in the lower row and the LED on this button stays on even when I press buttons in the upper row to manipulate the loop. I have written my own lua midi script and gui for Augustus which I’ve been able to extend even further since Os, its ever helpful developer, has built in some event timing support. So, for the first time since I discovered the joys of live looping I’m very content with my setup. That’s why I’m making it public here. Maybe someone finds it useful, too. And hopefully I’ll get to making more actual music now instead of working on my setup (well, one can dream). Augustus Loop v2.1.0 is now released (all formats/platforms). 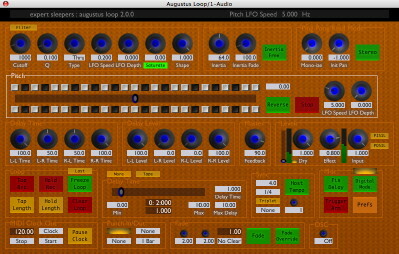 v2.1.0 adds some new functionality to Augustus's MIDI/OSC and GUI scripting. * ask for a function to be called after a certain amount of time, or regularly at a specified interval. Using these functions you can do useful things like distinguish between short and long footpedal presses, or detect double taps etc. A new form of the existing 'indicator' GUI item has been added, together with some corresponding MIDI/OSC script functions, to allow you to create GUI elements that reflect the state of scripted variables. As usual, get the update from the downloads page. These new features were developed after a request from Axel Baesler, who has used them to make a fairly complex script based on my Multilooper script. He's also made a custom GUI to go with the script, and provided a sample Live set and even a FCB1010 footcontroller patch to use with it. Get the script from the scripts page. * the pitch buttons now cause automation to be recorded. * the four delay time parameters (delay slider min/max, max delay and delay time) now use 'high resolution' mode automation. Augustus Loop v2.0.2 is now released. This is an AU-only bug fix release. It addresses an issue with recording parameter automation in Logic Pro. Augustus Loop v2 has been awarded the "EXCELLENT" software certificate by findmysoft.com. Augustus's page on that site is here. The Windows VST version of Augustus Loop v2 is now available - see the post below for more general details on the beta. Something of a milestone today - feature development work on Augustus Loop v2 is done, at least for the AU version. So all that remains is to make some presets, write the documentation (itself a not inconsiderable task) and then enter the world of hurt that is the VST and in particular Windows versions. Stay tuned for a probably public beta of AL2 sometime soon. In case anyone's interested (and I know at least one person is): starting with Augustus Loop v2.0, Expert Sleepers plug-ins will support OSC. The plan is to roll this out to the entire plug-in range eventually. If you need OSC in your favourite plug-in sooner rather than later, let us know! I'd like to acknowledge Ross Bencina for making available the open source library oscpack, which has made it much easier than it could've been to get OSC up and running in Augustus Loop. Thanks Ross! After much thought, I've decided that, despite the beta that was available a while back, the next version of Augustus Loop will not be v1.9.0 after all, but v2.0.0. So, apologies to those who were getting excited about the v1.9 features, but I think you'll be even more pleased with v2.0, which will have a whole load more new features in it, in part focusing on removing any possibility of clicks and pops from bad loops or sudden changes (e.g. when using Clear Loop). One new feature that I'm very excited about is a whole new implementation of the Freeze Loop function, which IMHO has never quite lived up to expectations. I have that working already and it's awesome. Really. I'll also use this message to announce that I'll be putting the price up a bit, mainly because v2.0 is a major upgrade, but also because of the continued weakness of the dollar against the pound (my prices are fixed in $ but I live in the UK so I receive the money in £). However my current plan is to continue my policy of making the upgrade price simply the same as the difference in prices of the two versions, so nobody buying the plug-in shortly before the new version is released will lose out. To put it another way - don't wait for the new version! Buy it now! Now! The Augustus Loop v1.9.0 beta 1 expired today. There will probably be another beta soon. In the meantime, please use the latest v1.8 version from the downloads page. Fixed a problem where Augustus Loop's GUI would stop Logic's Key Commands from working. Fixed an issue which could cause Apple’s AU validation tool (as used by Logic) to run very slowly when validating Augustus Loop on OS X Leopard. Augustus Loop’s GUI is now fully skinnable and scriptable. MIDI behaviour is now scriptable. Added Record Offset feature, which helps with latency problems in live situations (see this thread). * New 6-in 6-out configuration of the plug-in, allowing audio to be routed through external processing either side of the virtual tape. * Fixed an issue that could cause a crash in Logic 8 when opening a song containing multiple instances of Augustus Loop with their GUIs open. v1.7.3 now works on systems which do not have SSE2, notably certain Athlon processors (SSE is still required). Systems with SSE2 continue to use an optimised version. v1.7.2 fixes an issue which would cause the VST version to crash if the AU version were not also installed. It also further improves the plug-in's resilience to font installation issues. v1.7.1 is a minor bugfix update, addressing an issue on certain systems which have had the system fonts moved or uninstalled. The first ever Mac VST version of Augustus Loop is now available for beta testing. Features are the same as the earlier 1.7.0b1 (AU). I've just posted the first beta of the new Augustus Loop. The main new thing is the new GUI, which has been re-implemented using the same technology as the other plug-ins. This is what's going to enable a Mac VST and Windows VST version of Augustus not too far in the future. - The filter has been fixed. Previously the cutoff frequency was limited to about 2kHz, even though the knob goes up to 8kHz. Also it was possible to get nasty artefacts when using extreme filter LFO settings. Note: this does change the sound of the plug-in, if you were using cutoff frequencies above 2kHz. A global preferences setting to retain the old behaviour has been provided for people who need to use the new version to go back and revisit an old mix. - A 'Tape Stop' button has been added. This is great for 'finger on the turntable' type effects. Right now I'm very keen to hear from people who are experienced with previous versions of the plug-in, to find out if the new GUI has introduced any major issues. v1.6.0 adds 'digital mode', giving the option of clean, 'digital' looping, and saving CPU load into the bargain. See the manual for more information. v1.6.5 now responds properly to AudioUnitReset(), so in e.g. Logic the delay buffer will be cleared when song playback is started etc.